The network card in my file server died a few days ago, because of this some of the video files on this page are currently unavailable. I do not know when they will be back up again. 10 Jul 2002 - How about two? Q: What can be cooler than one 5.25" bay filled with LED's? I just recorded a new video (6MB), this time with the new hardware, of coz. Made with the same crappy webcam as before (colors are way off, and there is some flickering). No sound this time, sorry. 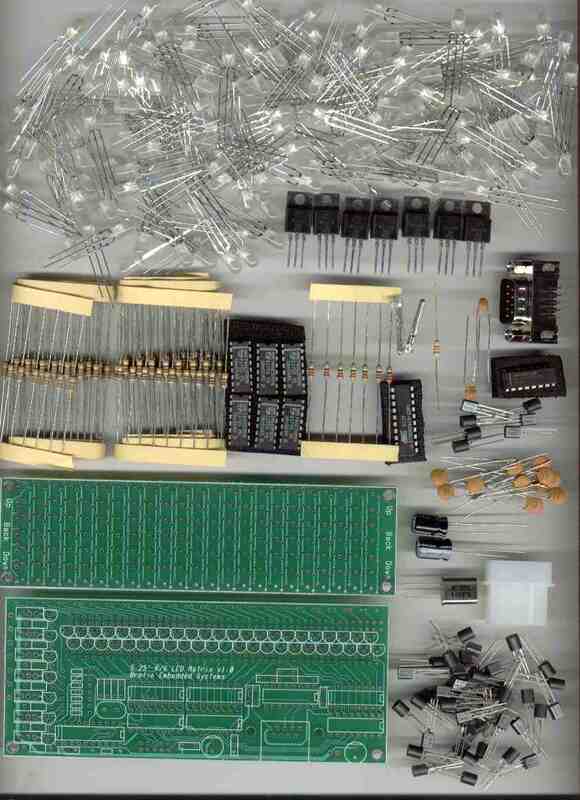 Due to popular demand I've looked into the possibility of offering this as a 'kit' with professional PCB's and a preprogrammed MCU. I've worked out a smaller more compact version (almost all thoose cables you see on the picture below will be gone) of the PCB's and sent it to a PCB manufacturer for a prototype. It should arrive any day now. I'll Post pics of the boards and how it looks with all components soldered as soon as I get it. Assuming the boards are OK, of coz. 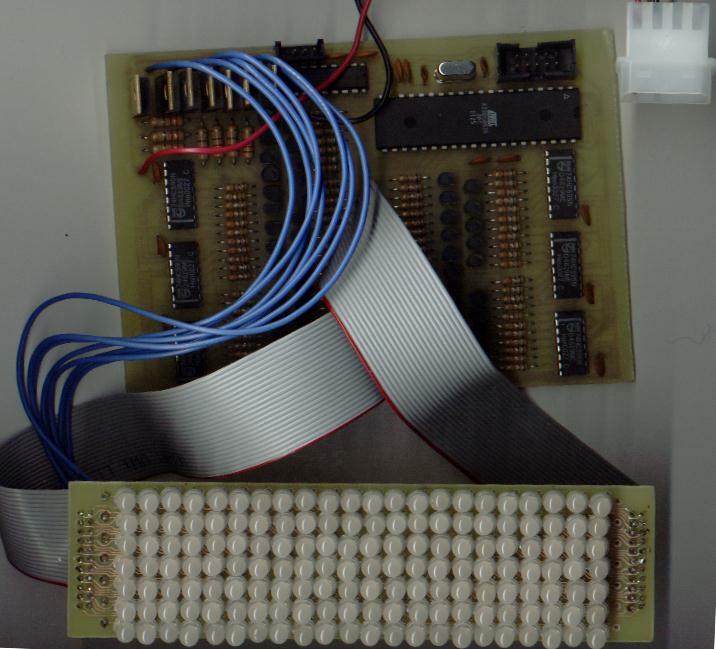 This next version of the matrix will have one additional column of LED's for a total of 23*7=161 dual color LED's. Normal Demo of the LED Matrix displaying Winamp frequency analyser. Fire Demo of the LED Matrix displaying Winamp frequency analyser in fire mode. Text Demo of the LED Matrix scrolling some text. For text scrolling, I just type 'echo "Insert text here" > /dev/ttyS0' at my Linux/UNIX prompt, or use a simple three line Visual Basic program when I run anything Microsoft. This is a project in progress, it's a 5.25" LED matrix built using 154 (22*7) dual color LED's that fits exactly into a empty 5.25" slot. 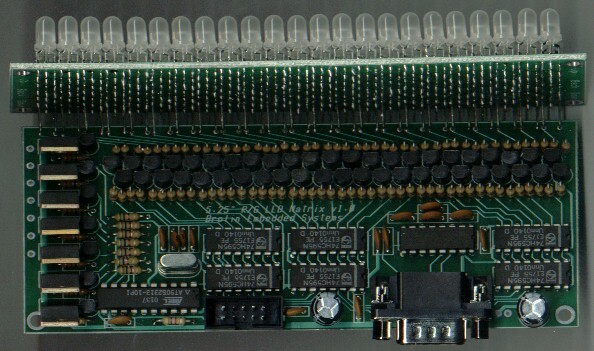 The driving electronics is built around a Atmel AVR. It can work standalone or connected to the PC. It connects to the RS232 port (that's the serial port for you software ppl) to make support under all operating systems and platforms easy, besides, I don't need more bandwidth than the RS232 can provide. All LED's can shine in red, green or yellow. (and hopefully, soon they can be any shade inbetween). A plugin for WinAmp/XMMS that displays the frequency analyzer on the LED's. Plasma effects might be possible when it can do shades. Displaying system status and network load, since all LED's can be green/yellow/red it will be very easy to make good looking meters.